Merchandise Bag - Medium -> A Small Bag Packed with Color on Both Sides! This Merchandise Bag is great for carrying around in stores, events, trade shows and more! Die cut handles of Merchandise Bag Designed to support all hand sizes. Can carry low-to-medium loads without snapping or overstretching.! 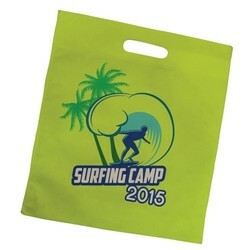 Price of Merchandise Bag Includes Full Color Sublimated Prints on Both Sides! Looking for a high-quality AND budget-friendly giveaway? Our Merchandise Bag is a perfect option! Sporting vibrant, full color on both sides, this flat, non-woven bag is the ideal size for carrying around in stores, events, trade shows and more! The die cut handles are designed to support all hand sizes and can carry low-to-medium loads without snapping or overstretching. 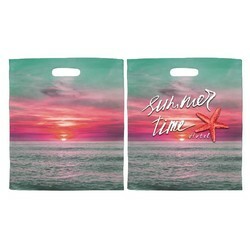 Price of Bag Includes Full Color Sublimated Prints on Both Sides!